Seven years after its last major terrorist attack, Morocco’s multifaceted strategy for dealing with Islamist extremism appears to be paying off security-wise—but at the expense of liberal reforms. Morocco lies in an unstable region with an ongoing Islamist terrorism problem but, with some international help, it seems to have regained control and hasn’t had an internal terrorist attack since April 2011. The kingdom portrays the fight against Islamist extremism as a war of ideas that can be won by preaching a tolerant, moderate and non-violent form of Islam. Before that, there were several terrorist attacks. In May 2003, suicide bombers carried out the deadliest terrorist attack in Morocco’s history, in Casablanca—45 people died, including the 12 suicide bombers who came from the nearby shanty town of Sidi Moumen. In 2007, several suicide-bomb attacks in Casablanca killed the perpetrators and one other person. 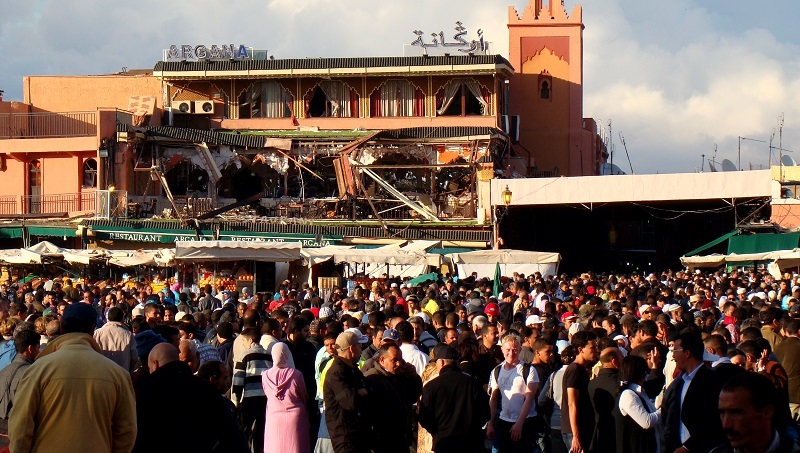 In April 2011, 17 people were killed in Marrakech when a bomb concealed in a bag was detonated at the Argana café, a popular tourist spot; the dead included a group of French students. After the 2003 Casablanca attack, Morocco implemented a counterterrorism strategy based on a three-pillar system: strengthening internal security, fighting poverty, and undertaking religious reforms. It also stepped up international security cooperation. Assistance from the US under its Antiterrorism Assistance program ensured that Morocco and its neighbours have common methodologies for countering terrorism. Since 2001, the Western Mediterranean Forum, also known as the ‘5 + 5 Dialogue’, an informal political, economic and cultural grouping of five countries from the Maghreb region (including Morocco) and five from southern Europe, has been a mechanism for addressing common terrorism concerns. In 2004, 14 regional countries, including Morocco, established the Middle East and North Africa Financial Action Task Force to focus on the threat of terrorism-financing activities across the region. In 2005, the US initiated the Trans-Sahara Counterterrorism Partnership to help 11 West African and North African countries (including Morocco) counter radicalisation and boost their counterterrorism capabilities. Morocco hasn’t taken the lead on any of these counterterrorism initiatives, but since 2011 it has become more proactive. One example is its involvement in the Global Counterterrorism Forum, an international forum of 30 member states, including Australia, established in 2001. Morocco was a founding member and in 2016 became co-chair of the forum’s coordinating committee. In 2013, Morocco, together with the US, announced the Initiative to Foster Cooperation Networks among Justice Sector and Other Law Enforcement Practitioners in the Sahel and Maghreb Region, with the aim of facilitating cross-border investigations. Morocco and the US also promoted the Border Security Initiative, adopted in 2016 by the Global Counterterrorism Forum and the United Nations Counter-Terrorism Centre to secure porous national borders through cross-border cooperation. Morocco and Algeria are the most influential countries in the Maghreb, but their ongoing border dispute has at times been an impediment to regional cooperation on counterterrorism. The conflict in Syria and Iraq has also had significant repercussions for Morocco. Between 2014 and 2016, some 1,600 young Moroccan men and women travelled to join Islamic State in Syria. Return of veteran extremists continues to be a major security concern. In response to the Islamic State challenge, Morocco adopted three major national counterterrorism measures. The first was a ‘home affairs’ approach to security. In October 2014, the Ministry of the Interior launched Operation Hadar (Arabic for ‘vigilance’), requiring the security forces to work together to combat terrorism. This resulted in enhanced security at airports, train stations and border posts. The second measure was to strengthen the legal system. In 2015, the Moroccan parliament amended the country’s counterterrorism laws to criminalise a range of possible terrorism-related activities, including travel to Syria. The third measure was establishment of the Central Bureau of Judicial Investigation as the lead agency for counterterrorism in Morocco. Since 2015, it has been responsible for numerous terrorism-related arrests and is credited with preventing several terrorist attacks in Morocco. European countries have also worked closely with Morocco, providing counterterrorism training and equipment, and conducting joint operations with Moroccan security forces. Morocco is said to be a capable security partner that closely monitors its population and controls domestic religious activities. But to do so, it relies on a repressive political and security system. The powerful Moroccan security service, the General Directorate of Territorial Surveillance, is believed to abduct and torture regime ‘enemies’—including political activists, suspected terrorists and separatist dissidents. Morocco continues to resist outside calls for liberal reform. Australia now has an embassy in the capital, Rabat. Former foreign minister Julie Bishop announced the embassy’s opening on 16 November 2016, describing Morocco as ‘an important addition to Australia’s diplomatic network in Africa’. Although Australia participates in international counterterrorism forums with Morocco, because of its distance from our region, we have no bilateral counterterrorism relationship with Morocco—nor do we have any official counterterrorism involvement in the Maghreb. Clive Williams is a visiting professor at the Australian National University’s Centre for Military and Security Law and an adjunct professor at the Australian Defence Force Academy. He recently spent three weeks in Morocco. Image courtesy of Bjørn Christian Tørrissen on Wikimedia Commons.